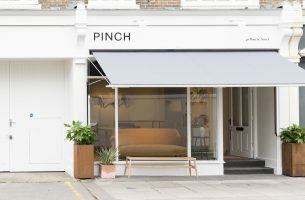 Having spent 13 years building our portfolio, we have now brought our coveted furniture to the capital’s most characterful and burgeoning interiors district. Located at 46 Bourne Street, the shop, which once belonged to influential cookery writer Elizabeth David, will showcase our collection of carefully refined yet iconic designs including cabinetry, upholstery and lighting, all of which will be rotated on a regular basis. What we love about the area is that everyone is united by their appreciation of quality, and a passion for what they do, be that architecture, antiques or interior design. We look forward to welcoming new and loyal clients into our space; to discuss bespoke projects, or simply pop in to take possession of some of our smaller pieces. Our shop will allow us to lift our furniture off the pages of magazines, to really let customers get close to the pieces and to bring our story to a much wider audience. We hope to see you soon.